EKK 2013, Jerry Santos Sweeps Kaua’i. Sending you a big Mahalo for another wonderful experience at E Kanikapila Kakou. It is wonderful to see how your hard work and dedication over the years has come to fruition. I wish continued success and hope we can be a part of it again sometime in the future. Please know your kindness and aloha is very much appreciated. Jerry Santos: All Time Favorite! If it ain’t broke, don’t fix it! If that can apply to Hawaiian musicians and their songs, it definitely applies to Jerry Santos. Throngs flock to hear his music . . . as we found out at last EKK Monday. We were expecting many to show up but what we ended up with was waaaaaaay more than we bargained for. I got comments like: “Where are we moving to next? The Stadium?” “You should have had this in the Convention Hall!” In addition to the usual 150-plus EKK newbies who are sent each week by families and friends to not miss out on Kauai’s musical gem and the huge gang of nearly 300 EKK faithfuls who never miss a single Monday, we had an outpouring of new Kaua’i residents who, of course, know not to miss out on an evening with Jerry Santos because it it’s Hawaiian music they want, it’s Hawaiian music they will get. Along with his super talented cousin Hoku Zuttermeister and his long-time favorite hula dancer Nalani Badua-Fernandes, Jerry put on a non-stop show of our favorite Hawaiian songs — too many to list but everything from old time party favorites, songs from ukulele and hula classes, songs learned from friends, to new songs that have been introduced to us by THIRTY YEARS OF HAWAIIAN COMPOSERS AND MUSICIANS (see history at end). Yes! One would suppose that having been inundated by so many years of musical greats, musical neophytes, musical favorites in just about every style of Hawaiian music imaginable, we would all be so jaded about what we love about Hawaiian music….then along comes Jerry and his gang and we thrill at every musical moment shared with us. Jerry’s voice is unmistakable and hard to describe, but if you hear it, you know it is Jerry. When he sings Song of the Year Come to Me Gently, it’s a chicken skin moment. Add to that the remarkable falsetto quality of young Hoku who knows every single song that Jerry throws out; he carries the verses in song as Jerry in his Portugee story-telling style translates the Hawaiian lyrics into English so we can all get the underlying meaning hidden in the songs. Then out on stage dances Nalani to put song into the graceful visual story-telling that we call hula. Such a combination was so mesmerizing that in spite of a record crowd packed into the Jasmine Ballroom, the place was hushed and calm to take in the magic of the moment and exploding into applause that was almost startling in its decibel. One of Jerry’s favorite style of sharing songs of old Hawai’i is the rapid-fire round robin he calls “Hawaiian Music 101” as each artist tries to out-sing the other with song after song that has shaped Hawai’i — songs of the winds, the rains, and our connection to the land. I later asked Jerry, “Do you have a planned playlist to see what songs you guys will be singing in that portion of the show?” “That would take all the FUN out of it; tonight there was only two of us but you should see what it’s like when there are three to five of us and we are all trying to come up with another song when it’s our turn….that’s FUN!” Something to look forward to! You could see Hoku’s delight; he let out a huge laugh every time Jerry came up with his song. I love Kauai by his long-time friend Cindy Combs of Hanapepe is his song choice for the host island and also Nani Kaua’i to introduce the elegant hula stylings of Nalani. 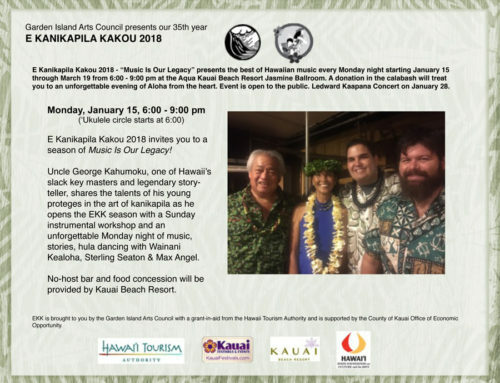 New songs for old stories as captured in compositions by his cousin Frank Kawaikapu’okalani Hewett, fast becoming some of the most favored songs for hula dancers, were shared by Jerry and Hoku. Jerry’s story-telling which serves as time to tune his guitar is called “Portugese Curse” by Hoku and “Portuguese Blessing” by Jerry, but either way the songs without the life-lesson stories would be receiving only half the story since many of the lyrics are in Hawaiian. When you hear the translations to songs like Ka Pilina and ‘Akahikuleana A Ka Piko, the songs mean so much more and the hula motions are better understood. Don’t change that! Hoku is the lucky recipient of several of Kawaikapu’s most beautiful songs, Ola’a Beauty being one that he recorded. He also sang a song by his grandmother hula master Emily Zuttermeister who for many years was one of the judges at the Merrie Monarch Hula Festival. It is a song about the ‘Ilima blossom that represents the island of ‘Oahu. Interesting trivia here is that the naming of flowers to represent each island came about as a result of the early Aloha Week Festivals. Ya learn something new each time. My Yellow Ginger Lei, the first hula I learned as a youth, is too often taken for granted until you hear someone like Hoku with his powerful falsetto singing it in Hawaiian. Another song that the duo captured in Hawaiian and was appreciated anew was Pupu Hinu Hinu (Pearly Shells), a beautiful melody too often deemed one of Don Ho’s song for the tourists. Over the years through discussions with some of Hawai’i’s best known musicians, I gathered that Don Ho is held in high regard by many of them as a multi-faceted pioneer and pillar in the world of Hawaiian music who has helped many young musicians. Jerry shared the story of a song he wrote upon his visit to Portugal with KITV’s Pamela Young (Mixed Plate) — Through My Grandmother’s Eyes, a song about his Grandmother Freitas who for most of her life lived in Pakala, delivering all the babies in that frozen-in-time little plantation town on the westside of Kaua’i. She is also the Great-Grandmother of Hoku. Interesting post-performance discussion is that when one connects all the dots of who is related to who through marriage and relationships many times removed, I am kinda-sorta related to Jerry and Hoku. Only in Hawai’i. Like so many of us who grew up as teenagers with parents who told us, “Don’t come home until the sun goes down,” Jerry was hungry to experience life on the continent and migrated to the mainland after he graduated from Kamehameha School, attended UH and Kapiolani Community College, and did the Honolulu nightclubs stint. One lonely night in San Francisco a voice in his head says, “An island boy belongs on an island.” His signature song of Ku’u Home O Kahalu’u, a unique blend of traditional Hawaiian music and contemporary rhythms, emerged out of this realization and is now considered a Hawaiian classic. This song must ring true for so many others who have grown up in Hawai’i, moved away to experience a larger rock, and returned to the islands with new-found appreciation for their home. Although many artists choose to sing that song, Jerry’s version is the real deal and very special. The songs by Na Lani Eha, the four Hawaiian monarchs, form a rich repertoire of Hawaiian music that many love to sing. We were treated to some of the best known and best loved by Jerry and Hoku. E Ku’u Sweet Lei Poina ‘Ole penned and gifted to Robert Beaumont by Emma Alexandria K. De Fries, curator of the Queen Emma Summer Palace in the 1970’s, is about who we are as Hawaiians . . . inspired by circular clouds in the sky and laced together like petals in a flower lei. This song was taught to the ‘ukulele and hula groups and performed together as an impressive grand finale for the evening. All those dancers moving in unison on the stage and the brave ukulele players showing off to the whole audience; it was truly a heartfelt moment of everyone giving and receiving the gift of music and dance. What a wonderful magical evening! This coming week we have the rare opportunity to present a musical family with cute-as-a-button Quinn, statuesque Emily, the birthday boy Timi, along with manager Mom Lanet on the upright bass and dad Tim capturing it all on video. Come and meet them.